Join us on Wednesday, January 23 from 6:30pm to 8:30pm to get acquainted with the unusual wool produced within 150 miles or less of ImagiKnit, hands on! Stephany Wilkes, certified sheep shearer, wool classer and author of Raw Material: Working Wool in the West, will relate the hidden story of how wool moves from sheep to sweater! She’ll have raw wool samples to illustrate crimp, color, length, strength and fineness. The workshop will cover different breeds of sheep (with a focus on California sheep and wool) and how characteristics of wool are reflected in locally made yarn. Participants will learn how to class and grade wool samples. The cost of the workshop Is $35. Bring your knitting and join us for a fun evening and learn about the fiber that we all love so much! We're excited to be hosting a window installation by local fiber artist Steffanie Goodman of Heirloom Culture! Steffanie designs and makes unique wall hangings and accessories. Her company, Heirloom Culture, provides unique decor for the chic and artful collector. Steffanie's work is beautiful and unique! We had an opportunity to ask Steffanie some questions about her work. My work is eclectic- contemporary and refined, yet organic and playful. I am always exploring new techniques, materials, styles and color combinations. My color story is often bright jewel tones with whites and gold, but I also work with neutral pallets. Those decisions are often based on my mood, design trends I find inspiring, or my clients' needs. I create unique wall hangings and women's accessories, and also do commercial art installations on occasion. I work primarily with natural fibers, and often incorporate repurposed or industrial materials like metal, leather or wood. For example, I create meaningful art for clients by repurposing sentimental materials and weaving them into the piece. I love exploring the qualities of fiber- it's texture, permeability and color, and the balance of soft and opaque, against the shine and durability of metals, or wood. 2. How/when did you get interested in weaving and how did you learn to weave? Raised by a fine artist mother and garment industry father, I'd always had an appreciation for textiles, art, and fashion. 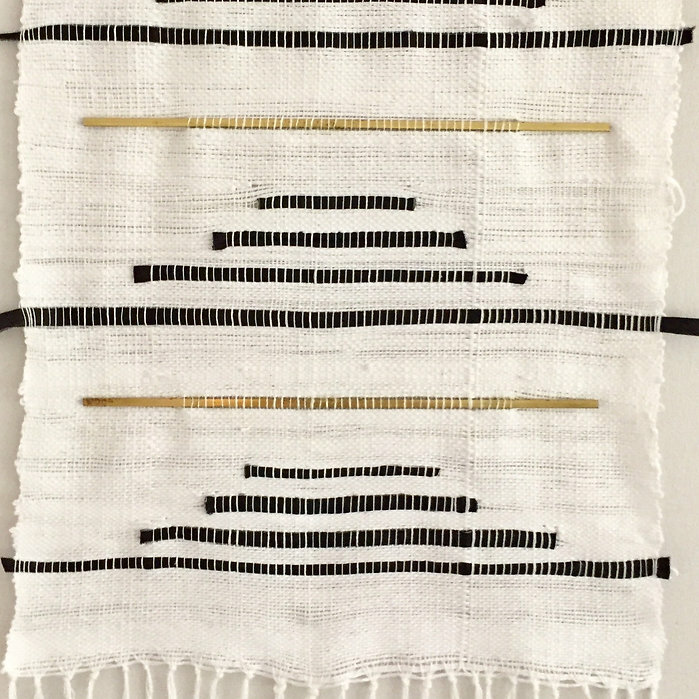 While healing after a serious injury in 2015, I was introduced to Saori weaving by a family friend when I showed her a picture I'd seen on Instagram of an abstract woven cloth and asked if she knew how it was created. I found a Saori weaving studio in Berkeley, unfortunately no longer there, and started weaving on the weekends. From the moment I began weaving I was captivated- it awakened me to the connection with female artisans of antiquity, reconnected me to my spirit and my passion to create. Since that time at Lynn Harris's studio in Berkeley, I've taken a Tapestry weaving course with Tricia Goldberg (Berkeley), a floor loom weaving course at CCSF with Janice Sullivan, workshops with Meghan Shimek and Alicia Scardetta, workshops at the Textile Arts Center in Brooklyn, NY, and apprenticed with Johanna Friedman, learning the steps for Jacquard weaving on her TC2 machine loom. 3. What types of materials do you work with? Natural and synthetic yarns (wool, wool roving, cotton, linen, silk, metallics, rayon, Tencel, jute), leather, metal chain and metal bars, wood, and even plant matter! Am I leaving anything out? Well, when I create memory pieces for clients I will repurpose the materials they provide me and weave them> I've woven horse hair, fishnet stockings, maps of Cuba- you name it! I often hang my work on metal dowels or clear acrylic dowels. Sometimes I frame them. 4. Where do you find inspiration for your pieces? I find inspiration in art (I stop into galleries and museums as often as I can, and read art blogs online), fashion (lots of window shopping and reading fashion blogs online), interior design (I love home decor! ), nature (beach scapes and flower gardens are the best sources!) and through my travels. 5. Do you do other types of work with textiles? I love exploring textiles and textile design. I have been repurposing clothing since I was a kid, cutting up and making anew, the things I was bored with, painting on my jeans, bedazzling things, making my own clothing when I was in college, DIY tie-dyed clothes in my bathtub, etc. I also do a bit of Shibori and natural dying, felting, some sewing, painting on fabric, embellishments, and am teaching myself block printing. 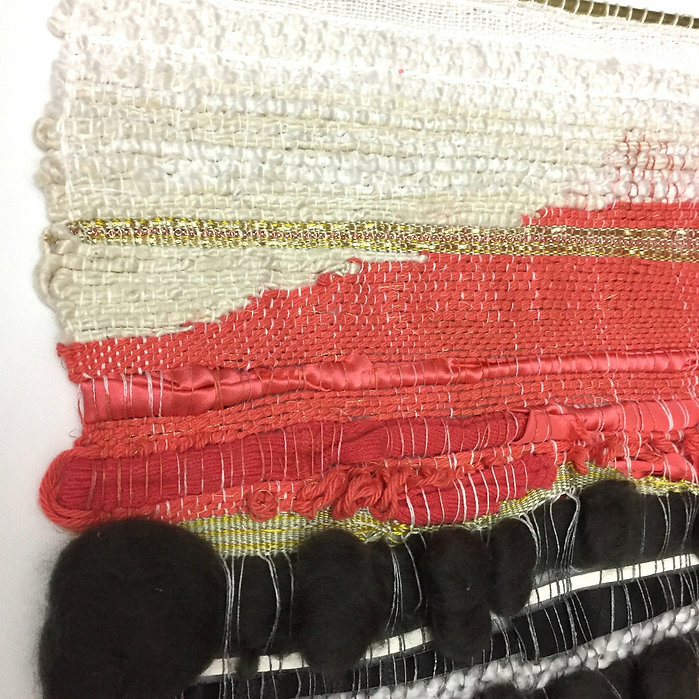 I am currently working on weaving a few pieces for a home that will be featured in a design magazine, I am designing new pieces for my next installation at a boutique in Hayes Valley this summer, and I am felting silk scarves for commissions for Mother's Day gifts! Stop by and check out Steffanie's work in our window! It's colorful and playful and just makes you smile! Click here to see more of Steffanie's work. Photos courtesy of Heirloom Culture. We're thrilled to be hosting an installation in our window by fiber artist Sheila Halali of Halali Studio! Sheila's 'Mini Hoop Series' was recently on display at the Abrams Claghorn Gallery in Albany. Her work is simply stunning! I like to think my work is romantically moody. I try to capture a certain energy and mood in each piece, and always throw in some small whimsical touches. 2. How did you find your way to the Hoop Series? I try to find as many ways as possible to use my scrap materials and make a slightly smaller impact on the environment. This Mini Hoop Series came out of one of those moments- I had finished my large pieces for the gallery and was left with tons of small remnants. The mini hoops are actually so much fun because they are quick to make, so you don't have to wait forever to see a finished piece like you do with larger works. I also love making them because they sell at a much more accessible price point, and open my work up to a wider audience. I've always been quite drawn to words- English was always my favorite class growing up (surprisingly I didn't love art class), and so I think it was kind of a natural form of inspiration when I started my creative journey. I'm constantly inspired by stories- by the human experiences that are so difficult to find words to express. I consider myself a "virtual storyteller" and strive to put those stories and experiences and emotions into a language that anyone can understand. 4. 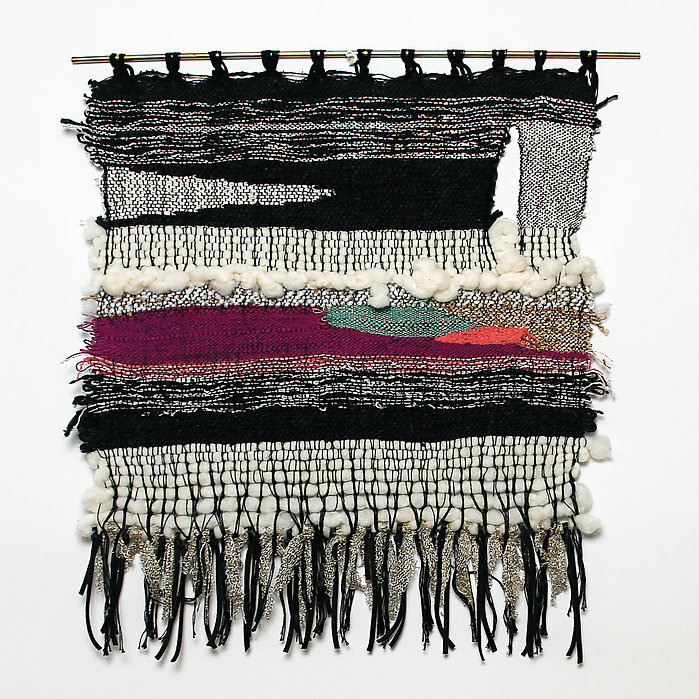 Is your work mainly with textiles? Yes- My formal training is in Fashion Design, which is where my love of textiles and fibres emerges. I love the malleability of textiles that is hard to find with other materials- when you learn to drape as a Fashion Designer you learn not to force the fabric to do something it doesn't want to you...you have to listen to how the fabric wants to react, and what it is telling you. That being said, I've recently started finding joy in some hard materials. I made a live edge wood table with the help of my boyfriend's dad, which has sparked an interest in wood. I also worked with copper for the first time for this project and am really excited to do so again. My work will always be focused in textiles, but I'm really excited to see how I can incorporate and mix new materials in! Both. Neither. I wish there was a word that combined the 2- that acknowledges the art that exists within craftsmanship. I've always struggled with considering myself an artist, since my training is in Fashion Design. I went to art school, and still never felt like an artist. There is currently a big movement around the "maker" community, which I find very appealing. Most of the people are Fibre artists, but it includes craftsman, artists, and yes, sometimes even crafters. But they don't discriminate or get hung up on the distinction. It is the most welcoming and friendly community of people around the world- they find their joy in the act of physically making things. This community is where I feel most at home at the moment. I just started a new large weaving- in creams and whites, which is way outside my comfort zone, but I'm trying to push myself this year. I am also designing and making a friend's wedding dress, which is probably the most exciting thing for me! I have dreams of one day having my own bridal line- nontraditional, with hand-woven, hand-dyed and painted elements. Something for the artistic brides, which I feel is lacking in the market still. Stop by and check out Sheila's gorgeous window display. Click here to see more of Sheila's work. We're thrilled that ImagiKnitter Jules Lustenader has her pattern published in Twist Collective January 2018. Congratulations Jules! Many of you may remember Jules. She worked at the shop a while back and is still knitting away here in San Francisco! We had an opportunity to ask Jules a few questions. 1. How did you learn to knit and how long have you been knitting? I first learned how to knit from a best friend in high school, but quickly forgot. It wasn't until college when I relearned backstage at a play I was in and I haven't put the needles down since! That was roughly 5 years ago. 2. When did you get interested in colorwork? Not sure when or how it started, but when people ask me to imagine "knitting", I always see a classic Fair Isle sweater first. Not sure why, it's just glued there in my head. My first colorwork project was coincidentally my first sweater project and I still wear it every Winter. 3. When did you start designing? 4. Where do you find inspiration for your designs? Now that I'm not in the yarn store every day, I find inspiration from my yarn stash. It may sound silly, but when I see a skein of beautiful hand-dyed wool, I can't help but picture what it wants to become, even what it needs to be. 5. What are your favorite things to knit when you are not designing? I adore sweaters, which is ironic because I live in San Francisco where we hardly need them! When I see a sweater design I love, I have to knit it regardless of how the weather is outside. I also enjoy knitting socks and hats for loved ones. 6. What do you have in the works for the future? My goal for 2018 is to publish a new pattern every month. So far, I have a shawl pattern I designed with a local yarn dyer set to publish in March and another pattern that will be published in Interweave's knitscene magazine this Fall. I also received yarn support from LoveKnitting and Malabrigo for patterns planned for release later this year. It's a tough goal I've set for myself, but all the support I'm receiving from third parties is tremendously helpful. We can't wait to see your next published patterns! Click here for more designs by Jules (Juliana Lustenader Designs). Again - congratulations Jules! You've come a long way in such a short time! Vogue recently published a great article on women sheep shearers, Women of the Wool, and SF local Stephany Wilkes was included! Many of you may know Stephany through her classes at the shop or through the Twirl Field Trip. It's fantastic that Vogue wrote an article about woman shearers and we're thrilled that Stephany was included!